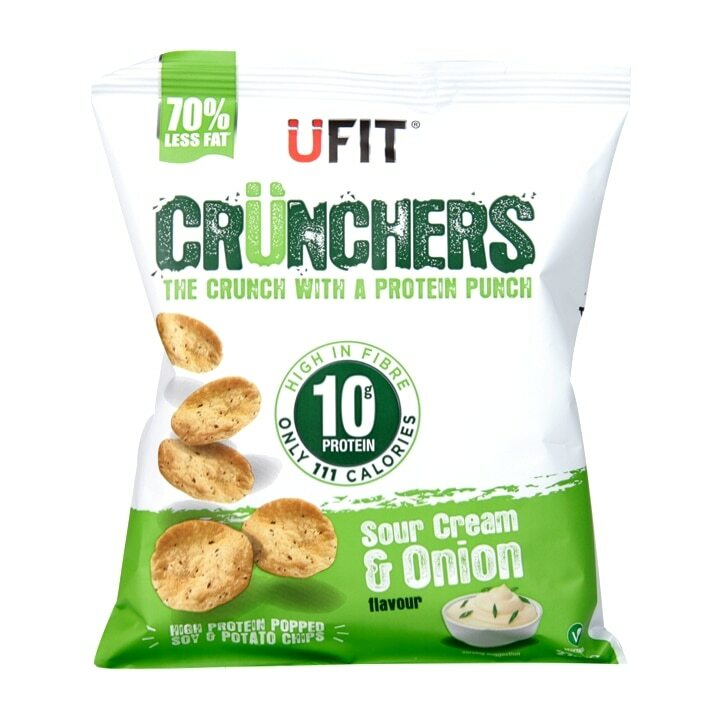 UFIT Crunchers are a delicious High Protein popped potato snack containing a whopping 10g of protein in each bag. We've kidnapped the humble potato and given it a protein packed makeover. The result? A guilt free snack that is bursting with flavour! UFIT Crunchers are popped and not fried meaning they have 70% less fat compared to traditional crisps. These delicious crunchy snacks are high in fibre to help keep you fuller for longer and away from tempting unhealthy snacks. Enjoy at any time of the day or night as a versatile and delicious snack. Enjoy as a health snack at any time of the day. Soy protein 47%, potato 20% (potato granules, potato flakes, potato starch), tapioca starch, sunflower oil, sour cream & onion seasoning, (onion powder, yoghurt powder (milk) , cheese powder (milk), salt, whey powder (milk), dextrose, yeast extract, flavouring (contain milk), parsley, acid (citric acid)), antioxidant (rosemary extract). May contain traces of Gluten. Packed in a protective atmosphere. UFIT Crunchers High Protein Popped Chips Sour Cream & Onion is rated 5.0 out of 5 by 4. Rated 5 out of 5 by Beth24 from The perfect crisp replacement! The perfect crisp replacement! Amazing flavour and not to stingy with the amount you get in the packet! Rated 5 out of 5 by Sammyfitness from Amazing taste and 10g protein! I recently purchased these and I wasn't expecting them to be as good as regular crisps but they were even better! I will be buying daily from now on.